We Heart Yarn: Rocktober Socktoberfest comes to a close...or does it? Rocktober Socktoberfest comes to a close...or does it? Socktoberfest 2006 is officially over...or is it??? We here at WHY have had a blast of a time with our own little KAL celebrating, what else? The Sock!!! 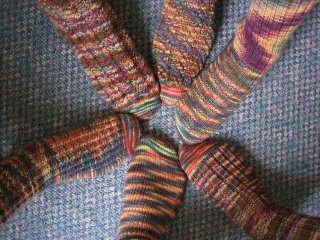 We all finished our socks during Soctoberfest and had a grand time during our final photoshoot (Great photos S!) (we missed you Julie!)! This KAL was the embodiment of our earlier post that told of our different histories and approaches to sock knitting. For this KAL we all used the same yarn, STR "Rocktober" medium weight. Some of us toe-upped, some cuff-downed. Traditional short rows vs. short rows with mini gussets vs. short rows with mini heel flaps. 2 x 1 Ribs. Cable ribs. Moss stitch cuffs. Yarn overs. Ribs embossed with leaves. I think most of us were magic looping....but I won't bet my first born cat on that!! We had horizontal stripes, we had vertical stripes, we had double back waves of color. We had picot edges, or not. Our socks are as individual as we are. We heart that. The days are shorter and darker now. The skies are gray and we've had an onslaught of infamous Oregon rain. The leaves are curling...browning...and falling to the ground. We are into November now. This month doesn't lend itself to a catchy name like Socktoberfest...but nonetheless...the celebration goes on...Socktoberfest was such a hit here in the zip code of WHY, that we are launching our next round of sock knitting goodness and are embarking on the "Sock the Winter Blues Away" KAL. No rules. No big expectations. Just knitting socks together throughout the holidays and chilly winter months. We began November 1 and will end in February. Most of us are starting off with some holiday themed socks--STR "Jingle Bell Rock", "Christmas Rock" and "Dreidel" seem to have caught the soles of many of us! But, anything goes...as long as we're knitting with our friends!! Thank you for checking up on us during Socktoberfest 2006!!! We hope you had as much fun following our progress as we enjoyed knitting our Rocktober socks! Please do check back now and again to see how we're keeping the winter blues away! !